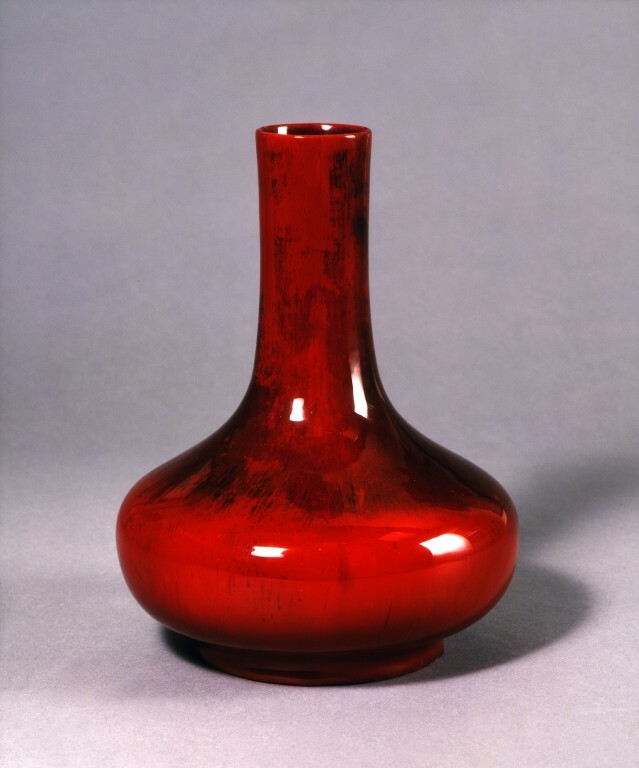 This vase is a purely decorative object which met fashionable taste around 1900 . The form is a 'double gourd' shape, copied from Chinese ceramics of the 18th century. The glaze is copied from Chinese rouge flambé. 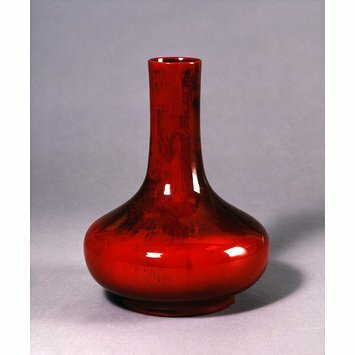 This vase would impress as evidence of the owner's knowledgeable and artistic taste. After the closure of the family firm of Moore Bros. in 1905, Bernard Moore (1850-1935) set up his own kilns and decorating workshop at Wolfe Street, Stoke-on-Trent. Long before then he was a highly respected glaze chemist and a consultant to the ceramics industry on a wide variety of technical fronts. Throughout the 1880s and 1890s it is likely that he was experimenting with and perfecting the specialist and difficult glazes with which his name is now principally associated. Based on mineral (usually iron or copper) oxides, flambé glazes (or transmutation glazes) are fired at high temperatures (up to 1500º C) in a kiln atmosphere that is rich in carbon monoxide, owing to the shutting off of oxygen at a critical moment. (This is known as a 'reducing' atmosphere.) This results in a violent reaction within the glaze, which is transmuted into an unpredictable range of reds, purples, blues, lilacs and greens. The glaze was perfected by the Chinese in the 18th century and first copied successfully in Europe in the later 19th century. A less demanding version offering a similar appearance could be achieved by using a slip oxide fired at a low temperature. Unlike the true flambé, however, this was easily scratched.